Nike, Inc. is an American multinational corporation which is the world's largest supplier and manufacturer of athletic shoes, apparel and other sports equipment. The other major players in this sector are Adidas, Puma, and Under Armour. Nike, Inc. includes the Nike, Converse, Hurley, and Jordan brands and the company is headquartered in Beaverton, Oregon, in the United States. The company takes its name from Nike, the Greek goddess of victory. Nike is famous for its 'Swoosh' logo as well as its "Just Do It" slogan. Nike markets its products under its own brand, as well as Nike Golf, Nike Pro, Nike+, Air Jordan, Nike Blazers, Air Force 1, Nike Dunk, Air Max, Foamposite, Nike Skateboarding, Nike CR7, and subsidiaries including Brand Jordan, Hurley International and Converse. Globally, Nike sponsors many high-profile athletes, such as Cristiano Ronaldo, Rory McIlroy, LeBron James, and Roger Federer as well as sports teams like Barcelona, Manchester City, and Paris Saint-Germain. As of 2018, Nike was the most valuable global apparel brand, with a brand value of 28 billion U.S. dollars. Nike also held the largest with a market share of 2.8 percent in 2017. The company also has a very strong financial record, generating over 30 billion U.S. dollars in revenue each of the last four fiscal years. Nike has three main business segments: footwear, apparel, and equipment. 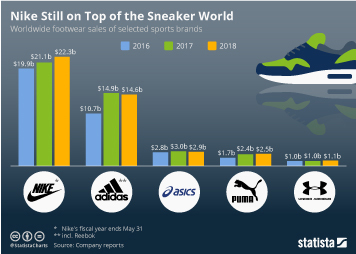 In 2018, footwear led the way in terms of sales revenues, bringing in over 22.2 billion U.S. dollars in 2018. Converse is owned by Nike and is one of the company's success stories, generating steady revenues year after year. The company employed about 73,100 people worldwide in 2017. The North American region of Nike generated the largest portion of the company's revenue with approximately 14.9 billion U.S. dollars in 2018. The United States is a core market for Nike, with the company generating approximately 42 percent of their overall revenue there in 2018. Nike is one of the most popular brands amongst men and women when it comes to athletic apparel worldwide. In the United States it is also the favorite sport apparel brand of both men and women. Unsurprisingly a large proportion of Americans own Nike brand apparel. In 2018, 55.38 percent high income earners in the U.S. said that they owned apparel, accessories and shoes from Nike.